Mango Curry Chicken - This time of year when everything gets so busy, we all deserve to be able to make a tasty dinner that requires minimal effort. 'I had 'made this awhile back, much to the acclaim of myself and my husband, and then last week I couldn't think of what to make for dinner (a universal problem) and I remembered this dish. 'Because I was aiming for easy on all fronts, I went to the closest grocery store to where I live, which happens to be a Trader Joe's. 'I was hoping they would have mangoes, which they did, at about $2 each. 'While I've certainly paid that much before, I wanted to have a lot of mango in this dish and didn't want to spend quite so much. 'I decided to check out the frozen fruit area, and picked up some mango chunks there for a much better price. Also, because I am going for easy, I often resort to my Better than Bouillon chicken stock base, which I use quite often. 'I've heard people say that it is too salty, and perhaps for some preparations it is, but overall it works just fine for me. 'Also, I bought this giant can of curry powder at an Indian market awhile back, because my husband thinks curry powder makes everything taste better. 'There have been a few instances where he was surprised to learn that it does not. For such a simple dish, I will say that after having made this twice, I'm going to give you a lot of options. 'For instance, I did prefer the fresh mangoes over the frozen, but the frozen worked just fine. 'Also, the original recipe calls for white wine, but I think you can use chicken broth instead if you don't have any wine around. 'Also, for the chicken, you can use whatever pieces you want. 'The first time I made it, I just got a selection of legs and thighs, but this time, I bought a whole chicken that had already been cut up. See? It's flexible. 'All that to say, I love how easy this is to make, and how great it tastes for such little effort. 'It's so important to have these kinds of recipes on hand. Place chicken pieces in a large bowl and coat with 1 tablespoon olive oil (or more if needed) and sprinkle salt and curry powder, stirring pieces around to make sure chicken is well coated. Heat 1 tablespoon olive oil and 1-2 tablespoons of butter over medium high heat. 'When butter has melted, add the chicken, skin side down and cook until the skin is golden brown. After you add the chicken, smash the garlic cloves with the side of a big knife, then peel the garlic and throw the cloves into the pan. After the chicken skin is golden brown, turn the heat down to medium-low, and cover with a lid, cooking for 35-40 minutes, turning the chicken over about halfway through. 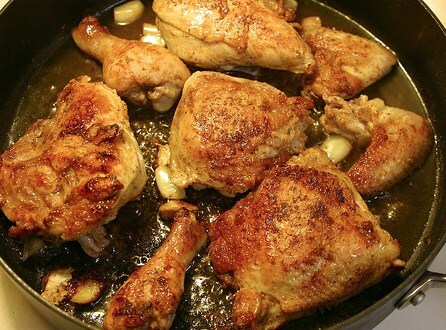 Once the chicken is finished cooking, remove from the pan. 'Tilt the pan a little and remove most of the fat with a spoon, then turn the heat back up to high, and add the wine or chicken broth, scraping up the brown bits and garlic cloves with a wooden or silicone covered spoon. After the liquid had reduced by about half, add the mango chunks and parsley, and simmer for a minute. 'Add salt if needed. 'Pour the mango parsley mixture over the chicken, and serve with rice.